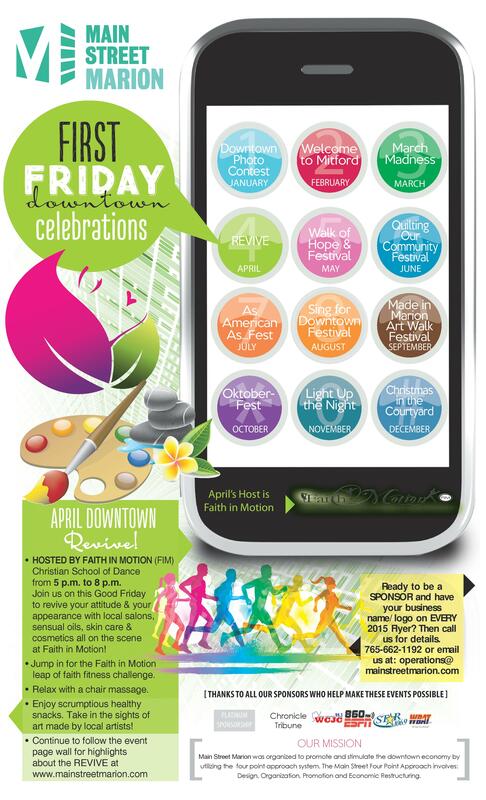 April First Friday also known as REVIVE will be hosted by Faith in Motion Christian School of Dance (FIM) from 5 – 8 p.m. Join us on this Good Friday to revive your attitude and your appearance with local salons, sensual oils, skin care and cosmetics all on the scene at Faith in Motion! Jump in for the Faith in Motion leap of faith fitness challenge. Relax with a chair massage. Enjoy scrumptious healthy snacks. Enjoy art made by local artists! FIM is holding a Fitness Party highlighting our Zumba, Bootcamp and Yoga Group Fitness classes from 6 – 7 p.m. There may also be a mini Hip-Hop class!! Minority Health Coalition is partnering with Faith In Motion on the Leap of Faith fitness challenge, and they will have some pretty neat prizes including but not limited to, a free fitness pass and new workout shoes! Event flyer below. Save the Date! April 3rd from 5 – 8 p.m. You can also join the event online – April First Friday Facebook Page. Want proof that downtown Marion has a happening scene? Join us on the first Friday of every month to experience all the sights, sounds and tastes the downtown has to offer — with an event that could only happen here. The First Friday Series is hosted by the Promotions Committee to orient people to the downtown district, highlight different downtown venues, and attract diverse audiences, entrepreneurs, and consumers. Our promotions committee co-chairs are Happi Stoffel and Marc Lobdell. You can join the Promotions Committee by emailing operations@mainstreetmarion.com. Thank you for fostering growth downtown Marion!